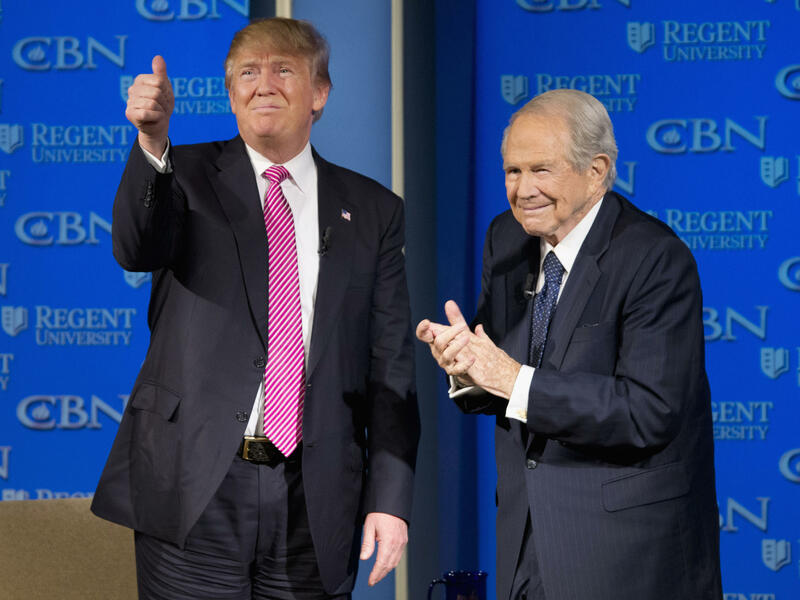 Republican presidential candidate Donald Trump is accompanied by Pat Robertson after speaking at Regent University in Virginia Beach, Va., in February 2016. Attacks on the press are a hallmark of President Trump's style, and he has avoided much of the media, often preferring Twitter to sit-down interviews with journalists. But a religious TV network has scored interviews with Trump and members of his administration this year, surpassing more prominent networks and news organizations in its access to the administration. The Christian Broadcasting Network, or CBN, is best known for The 700 Club — a Christian talk show that has been on the air for decades. It's hosted by the controversial televangelist, one-time Republican presidential candidate and CBN founder Pat Robertson from the company's headquarters on the campus of Regent University in Virginia Beach, Va.
After the deadly mass shooting in Las Vegas in October, Robertson cited a Bible verse warning that wickedness will lead to "violence and strife." He then made a connection between violence in the U.S. and what he described as a lack of respect for authority, including a "profound disrespect of our president, all across this nation." Robertson has spoken favorably about Trump since the campaign. This summer, the two sat down for an interview, which Robertson opened by telling the president that he is "so proud of everything you're doing." An analysis by Mark Knoller of CBS News found that since taking office, Trump gave the overwhelming majority of his network TV interviews to Fox News. He did, however, grant an interview to The New York Times on Thursday at his Florida golf club. The Christian Broadcasting Network has had two interviews with the president this year — which is on par with The Wall Street Journal and more than The Washington Post or The Associated Press, as of late October, according to Knoller's count. Pat Robertson's son, Gordon Robertson, is the network's CEO. He says access to Trump since the campaign has helped to raise CBN's profile outside of its conservative Christian audience. "Other news organizations are saying, 'Wow, we didn't know about this CBN News. And how does David Brody get so many interviews with Donald Trump?' " the younger Robertson says. Brody, CBN's chief political correspondent, says he first interviewed Trump in 2011. He says Trump understood early on the importance of courting evangelical leaders. Trump also seemed to understand that winning them over might take some effort, given his history of multiple marriages and reputation for vulgarity. "It's pretty funny because he walks in with a picture of his confirmation when he was a teenager ... just to say, 'Hey, look, see — here, I'm a Christian, take a look,' " Brody says. Over the years, Brody estimates, he has interviewed Trump about 20 times, including an interview for a book about Trump's faith that is due out in February. Days after Trump's inauguration, Brody sat down with him at the White House, where he asked about Trump's "spiritual journey" and his attitudes about prayer. "I tell you what," Trump told Brody, "I've always felt the need to pray, so I would say that the office is so powerful that you need God even more." In early December, Brody interviewed Vice President Pence, who described Trump as a "believer," a genuine Christian. "I think President Trump has a heart of gratitude for evangelical Christians in this country," Pence told Brody. White evangelicals overwhelmingly supported Trump in the 2016 election, and he has given evangelical leaders what several have described as unprecedented access to the White House. He has delivered on many of their priorities, including nominating U.S. Supreme Court Justice Neil Gorsuch and appointing abortion-rights opponents to key positions in his administration. Trump's relationship with evangelical leaders has thrived despite allegations against him from multiple women of sexual harassment and assault. Brody says many conservative Christians feel a kinship with Trump — the outsider who is ridiculed by the elites. He says they see in Trump a nostalgia for a time when many white evangelicals felt American culture was more explicitly aligned with Christian values. "He, in essence, has become their ... moral crusader, in a way," Brody says. "Which is so wild that a guy like this would be in the role of moral crusader — who would have ever thought Donald Trump, of all people, would have been that guy?" While Trump routinely scorns much of the mainstream press, he has been content to take his message directly to his base — on social media, and on CBN. Attacks on the press are just part of President Trump's style. Here's one. PRESIDENT DONALD TRUMP: Media outlets like CNN and MSNBC are fake news - fake news. KING: Trump does talk to The New York Times sometimes, as he did last night. But he seems to prefer Twitter to sit-down interviews with journalists. He talks mostly to Fox. Another of his favorites is the Christian Broadcasting Network. They're a religious TV network based in Virginia Beach. NPR's Sarah McCammon has that story. SARAH MCCAMMON, BYLINE: The network known as CBN is best known for "The 700 Club," a Christian talk show that's been on the air for decades. It's hosted by the controversial televangelist and CBN founder Pat Robertson. PAT ROBERTSON: Violence in the streets, ladies and gentlemen. Why is it happening? MCCAMMON: After the deadly mass shooting in Las Vegas in October, Robertson cited a Bible verse warning that wickedness will lead to violence and strife. He then made a connection between violence in the U.S. and what he described as a lack of respect for authority. P. ROBERTSON: There is profound disrespect of our president all across this nation. They say terrible things about him. MCCAMMON: Robertson has spoken favorably about Trump since the campaign. This summer, the two sat down for an interview. P. ROBERTSON: Mr. President, I'm so glad to see you. I'm so proud of everything you're doing. MCCAMMON: An analysis by Mark Knoller of CBS News found that, since taking office, Trump gave the overwhelming majority of his network TV interviews to Fox News. The Christian Broadcasting Network has had two, which is on par with the Wall Street Journal and more than the Washington Post or Associated Press, according to Knoller's count. Pat Robertson's son Gordon is the network's CEO. GORDON ROBERTSON: Other news organizations are saying, wow, we didn't know about the CBN News. And, you know, how does David Brody get so many interviews with Donald Trump? MCCAMMON: David Brody is CBN's chief political correspondent. He first interviewed Trump in 2011. Brody says Trump understood early on the importance of courting evangelical leaders. He also seemed to understand that winning them over might take some effort, given his history of multiple marriages and reputation for vulgarity. DAVID BRODY: It's pretty funny 'cause he walks in with a picture of his confirmation when he was, you know, a teenager, just to say, hey, look. See? Here's - I'm a Christian. Take a look. MCCAMMON: Over the years, Brody estimates he's interviewed Trump about 20 times, including an interview for a book about Trump's faith that's due out in February. MCCAMMON: In Washington, D.C., on a small set in the modest CBN newsroom, Brody anchors a weekly online show called Faith Nation. On a recent episode, his cohost Jenna Browder took the audience on a tour. JENNA BROWDER: Hey, David. Hey, Faith Nation. That is right. We are here live at the Museum of the Bible in Washington, D.C.
MCCAMMON: Days after Trump's inauguration, Brody sat down with him at the White House. BRODY: Did you feel the need to pray more? Where are you on that? TRUMP: Well, I tell you what. I've always felt the need to pray. So I would say that the office is so powerful that you need God even more. MCCAMMON: In early December, Brody interviewed Vice President Mike Pence, who described Trump as a believer, a genuine Christian. VICE PRESIDENT MIKE PENCE: Well, I think President Trump has a heart of gratitude for evangelical Christians in this country. MCCAMMON: White evangelicals overwhelmingly supported Trump in the 2016 election. And he's given evangelical leaders what several have described as unprecedented access to the White House. He's delivered on many of their priorities, including nominating U.S. Supreme Court Justice Neil Gorsuch and appointing abortion rights opponents to key positions in his administration. Trump's relationship with evangelical leaders has thrived, despite allegations against him from multiple women of sexual harassment and assault. Brody says many conservative Christians feel a kinship with Trump, the outsider who is ridiculed by the elites. He says they see in Trump a nostalgia for a time when many white evangelicals felt American culture was more explicitly aligned with Christian values. BRODY: He, in essence, has become their moral crusader in a way, which is so wild - that a guy like this would be in the role of moral crusader. Whoever would've thought Donald Trump of all people would've been that guy? MCCAMMON: While Trump routinely scorns much of the mainstream press, he's been content to take his message directly to his base on social media and on CBN. Sarah McCammon, NPR News, Virginia Beach. (SOUNDBITE OF LYMBYC SYSTYM'S "1000 ARMS") Transcript provided by NPR, Copyright NPR.